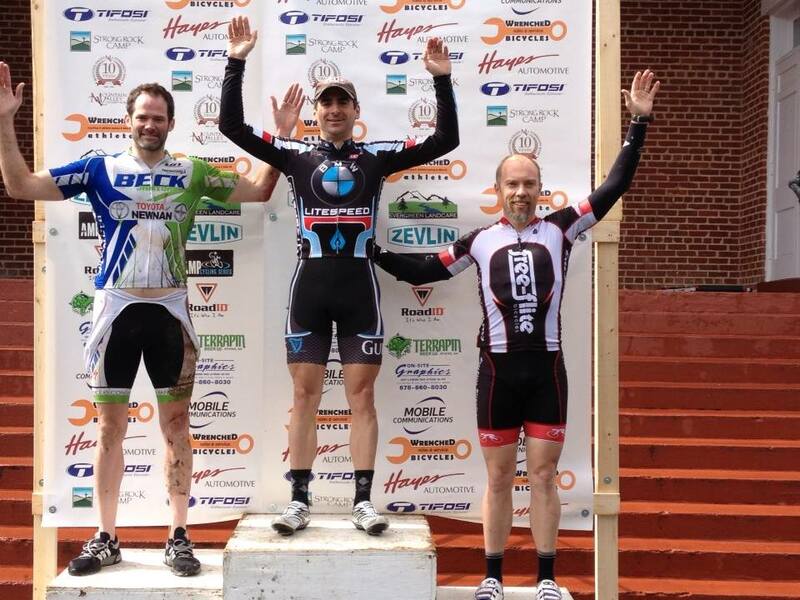 LITESPEED-BMW takes the GA State Crit for the 2nd Year in a row! Normally when the gun goes off in a race the only sounds one hears is the familiar snap of clipless pedals and clicking of the gears as racers sprint for the hole shot. On this particular day there was another sound, it could only be identified by witnesses as the sound of concrete screaming as the LITESPEED-BMW boys were ripping its face off. It was a barrage of machine gun fire as the team launched attacks. The other riders had no option than to chase us down and pray they landed into the correct move. John Atkins was very aggressive, chasing down prime after prime and trying to get away himself. But the boys did a bang up job of keeping him in check. After countless attacks by the guys a small break got up the road and Jordan made the effort to bridge up with another rider from the field. Shortly after making the connection that move fell apart. A couple laps later a five man shot from the field like a canon, led by none other than LITESPEED-BMW’s own Garey Gomez. Other strong men in that move were Frank Marrs, Oliver Flautt, Artur Sagat and Fletcher Lydick. Once established Jordan launched out of the field with another rider and in just over a lap joined forces with his teammate up the road. Boom….that was all she wrote for the rest of the peloton. The lack of organization from the other teams meant the jersey was up the road. And the LITESPEED-BMW boys were shooting moves down like they were sitting ducks. With Garey riding like ten men, driving the break, the riders had committed to lapping the field. After twenty minutes the break had made it around to the back of the field. By the time Jordan and Garey made it to the front the “Brew” train had already assembled. It was a mix of black and blue at the front of the field lining the race out. It stayed that way until five to go. Textbook crit racing. At that time the North Georgia team had started to assemble to the right of our train, planning on jumping us last minute. We were ready. Now one to go…. the racers started to swarm the front, muscles twitching, everyone nervous, game time. Legend has it the boys on the team are built from steel and forged from iron by none other than Vulcan himself. Neither confirming nor denying the myth no faltering occurred as other racers tried to rock the very foundation of that lead out train. With half a lap to go John Atkins went hard up the left side, Dave treated that move as a crazy ex girlfriend making a surprise visit and slammed the door shut in its face. Simultaneously the North Georgia boys went up the right and with Jordan in tow Hank locked onto them like a fighter pilot switching to missiles. Just before corner three Jordan leapt out of the field and dove hard, North Georgia had left too much room on the inside. Taking the hot line, he was able to gain the lead, dove hard into corner four, turned on the afterburners and held it to the line. LITESPEED-BMW had just won another Georgia State Championship Criterium Jersey. Big thanks to all the guys on the team as it truly was a team effort. Also a shout out to all of our amazing sponsors as it would not be possible without them: Litespeed Bicycles, BMW automobiles, Guinness Beer, Georgia Natural Gas, Rudy Project, The Marlay House, All 3 Sports and all others! Tim Henry Takes Another W In TN! The Roane County Criterium was a part of the Roane County Omnium, but with 2 young children at home I was only able to attend the Saturday evening crit. This is a new race for Middle Tennessee and it is a very nice course through downtown Rockwood. I would have never had reason to visit Rockwood without this race but I’m glad I did. I spoke with a few locals who were very excited to see the race come to town this April weekend. The Village Volkswagen team had 5 riders while every other team was 1’s and 2’s so it was obvious they were the team to beat. I was solo at this event. The course had 6 wide-open turns and a steady 10-15 mph wind that made breakaways difficult to sustain. The final turn was over 90 degrees and only 100 meters from the finish so I knew I had to be first through the final turn to win. There were continuous attacks from the Village VW team and early on everyone was chasing them down. I covered a few moves but nothing seemed to be gaining any serious time on the field. After covering some of those early moves, I realized I was getting tired and needed to tone down my aggression. By about the halfway point in the race, I decided to sit back, watch for any really dangerous moves, and otherwise hope that it came down to a field sprint. I jumped across to 2 more moves late in the race that looked promising, but we were brought back each time. After my last break attempt was caught (with 10 laps to go), A.J. Meyer from Village VW made a solid solo break. His team was happy to watch him go up the road and it looked like we would be racing for second place. But then after a lap of everyone looking around, the few teams with two riders decided to chase and we were back racing again. We started to eat into A.J.’s lead a little bit each lap. The race was getting harder with our pace plus the wind so I can only imagine how hard A.J. was working to stay out there solo. With 5 laps to go, A.J. was about 20 seconds in front of us and the rest of his team lined up behind the chasers to prepare for their leadout at the finish. I slotted in behind them and did not have too much trouble fighting off anyone that tried to take the wheel from me. The gap kept dropping until we finally caught the solo leader just before we got the bell signaling one lap to go. As we hit turn 1 for the final time, Village VW had 4 guys lined up on the front and looked to be in a perfect position to win the race. We kept a moderate pace until we got to near the end of the back straightaway, where the field swamped the tempo-riding Village VW team. For a brief moment, I was boxed in on the outside of the second to last turn (which is where I really needed to be at the front to sprint for the final turn). But then as we exited the turn, the riders in front of me swung left to get in the draft of the riders that had just swamped them. Bad move boys! I hit it on the far right of the group into a cross/head wind where no one apparently wanted to be except me. It was tough in the wind but I had clear road in front of me and I sprinted for all I was worth. I made it through the final turn first and used my cornering experience to carve the turn as best I could. I came out of the final turn with a bike length on the next rider and easily hung on to win. It felt great to pull off a W with very limited training and only 2 other races in my legs this season. Hopefully Litespeed/BMW can continue this trend. I know once my teammate Chris Brown can make it out to race with me, we will be the strongest 2 man team in Tennessee! 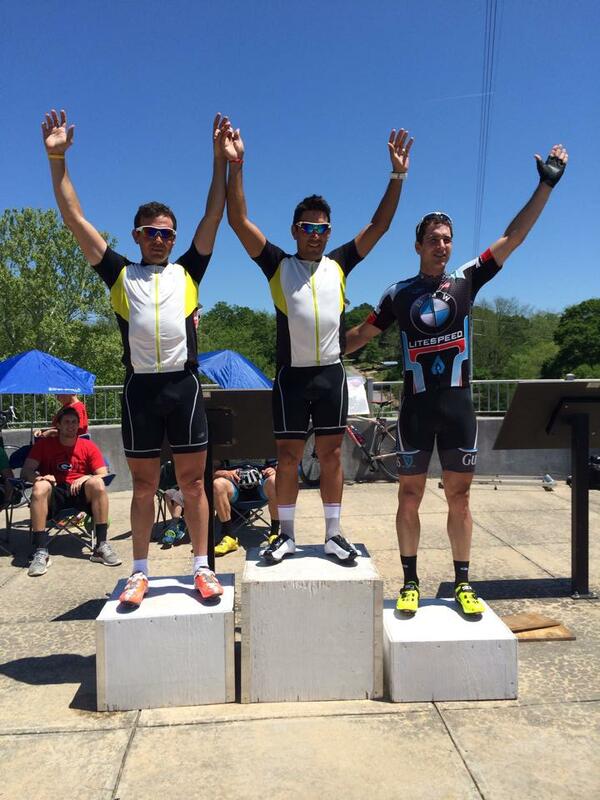 Gainesville Gran Prix Circuit Race – First Win of 2014! Chris Chotas and Brady Rogers flew the Litespeed-BMW flag at the 2014 Gainesville Gran Prix Circuit Race on a cold, rainy, and windy spring afternoon in Clermont, GA, just outside of Gainesville. With a relatively small field, nasty conditions, and a difficult course, it was determined early on that aggression would probably pay dividends (and with former Masters World Champion on the track, Steve Carrell, in the field, it was also a given that we didn’t want a field sprint). On the first lap, Chris tested the field with an attack on the stair-step climb on backside of the course, quickly putting daylight between himself and the field. After the crest of the climb, four riders were able to latch on and the group of five quickly began rotating to build an advantage over the field. Once the proverbial elastic had snapped, the gap grew quickly; and within a few minutes, it became apparent that this was the move of the day. Brady shut down the field behind, following any attacks that attempted to bridge, while Chris helped to keep things fast at the front of the race. Not liking his chances in a sprint, Chris attacked again on the last lap…on the same pitch that created the breakaway a few laps earlier, and again got a gap. One rider, Dan Busch of Beck Cycling, was able to respond, which left only two at the front of the race with about a mile remaining. Chris then forced Dan to lead out the sprint, and he was able to come around for Litespeed-BMW’s first win of the 2014 road season. 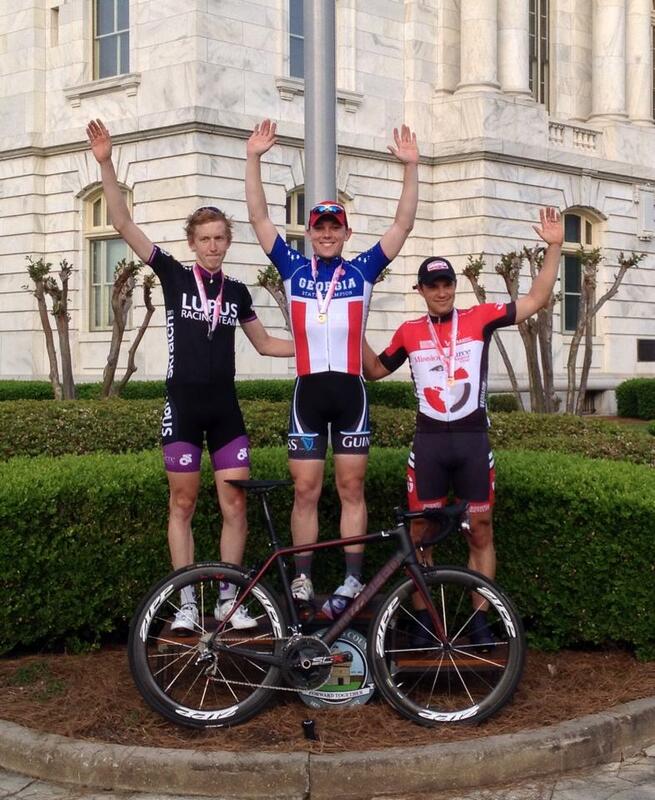 Athens Twilight 1/2 Criterium – Another Podium for the Team! We couldn’t have asked for a more beautiful day of racing for the Athens Twilight amateur races this past Saturday. Sunny skies and 80 degrees was the forecast for our noon start time (we were sure to have plenty of Clif Electrolyte Hydration on hand!). LITESPEED-BMW had 7 riders on hand for the race – Dave Gearhart, Hank Beaver, Colby Millen, Brady Rogers, Wes Parrish, Clay Parks, and Charles “The Chaz” Rossignol. It had rained that week, including the night before the race. The park that the course is on is very flat, low-lying ground next to Lake Allatoona. It doesn’t drain well at all, and mud often lingers long after a significant rain. The race was delayed by two hours so that the race promoters could groom and maintain the course to minimize the muddy spots, and more importantly, so that the racers would not do too much damage to the trail. It worked. There were plenty of small muddy spots, throughout the course, but it was far from the mud-fest that was predicted. Send us an email, like us on Facebook or follow us on Twitter.